In 1908 the White Star Line officially placed an order with Harland and Wolf to construct two new liners, larger than any liners yet in existence. These two ships were to be built side by side on massive newly built slipways, measuring 840ft by 270ft wide and up to 228ft high. These two â€˜sister shipsâ€™ were to be called Olympic and Titanic, and were later to be joined by a third sister ship, Britannic. Construction of Olympic started first, with her first keel plate being laid at Harland and Wolff, Belfast on 16th December 1908. Painted white for the benefit of photographers, Olympic was launched on Thursday 20th October 1910. After her launching, Olympic was towed to her fitting out basin, where installation of her heavy machinery and fitting of her luxury interiors began. Following her completion, Olympic started her sea trials on 29th May 1911; after successfully completing them, she then left Belfast bound for Liverpool â€“ her home port â€“ on 31st May 1911 â€“ on the very same day as her younger sister ship Titanic was launched. After spending a day in Liverpool open to the public, Olympic sailed to Southampton, where she arrived on 3rd June, to be made ready for her maiden voyage. Olympicâ€™s maiden voyage started from Southampton on 14th June 1911; Just like Titanic on her maiden voyage less than a year later, Olympic was under the command of Captain EJ Smith, and also had aboard J Bruce Ismay, the Managing Director of the White Star Line; Thomas Andrews, of Harland and Wolf, and many members of crew who would later serve on Titanic. Olympic arrived in New York on 21 June, after a successful crossing; although, while docking in New York a tug boat, OL Hallenbach, was damaged after Olympicâ€™s propeller caused the tug boat to be pulled into the side of the ship. On 20th September 1911, while in the Solent, shortly after leaving Southampton at the start of her planned fifth voyage to New York, the Royal Navy cruiser HMS Hawke smashed into the side of Olympic, causing serious damage to both ships. HMS Hawke suffered a badly smashed bow, while Olympic had two gashes to her starboard side, one above and one bellow the water line; both ships were able to steam back to port, and Olympicâ€™s voyage had to be cancelled. Despite the damage no one was seriously hurt, and following two weeks of temporary repairs Olympic returned to Belfast for repairs; which resulted in both Titanicâ€™s completion and maiden voyage being delayed. The Olympic returned to service on 30th November 1911. While on a voyage from New York to Southampton, on 24th February 1912, Olympic lost a propeller blade after hitting a submerged object in the Atlantic; Olympic was able to continue, however, upon her return Olympic had to return to Belfast, where she was repaired by workers working on Titanic; while at Belfast Olympic and Titanic where together for the last time. When leaving Belfast on 4th March, Olympic hit the bottom, and had to be inspected by divers, who found the ship to be undamaged. 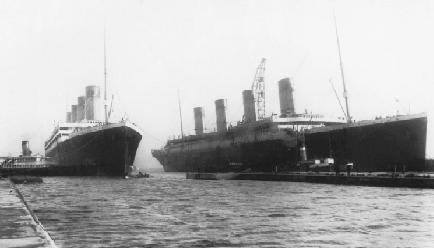 Olympic (left) and Titanic, together for the last time. At 11.40pm on 14th April 1912, while Olympic was sailing from New York to Southampton, Titanic collided with an iceberg and sank at 2.20am, with the loss of over 1500 lives. Titanicâ€™s wireless distress signals could be heard by Olympic, but being over 500 miles away, Olympic was not able to help. Upon Olympicâ€™s return to Southampton following the Titanic disaster, Olympic was loaded with extra collapsible lifeboats; this however, was not considered to be good enough by the majority of the ships boiler-room crew, who just before Olympic was supposed to leave Southampton for New York on 24th April 1912, went on strike, causing the voyage to be delayed. The next day, while Olympic was anchored off Spithead, the lifeboats were inspected and considered to be satisfactory, however, the strikers refused to return to the ship unless the few crew who refused to strike were removed from the ship; White Star refused to dismiss the â€˜loyal menâ€™ and were forced to find a replacement crew to replace the strikers; this then caused a further 53 members of Olympicâ€™s crew to desert the ship on the tender that brought the replacements aboard, out of fear that the replacements were inexperienced. Following efforts to resolve the situation â€“ including the Royal Navy trying to get the deserters to return, Olympicâ€™s voyage was cancelled. On 4th May 1912, the 53 crew members from Olympic who deserted on 25th April, were found guilty of refusing to comply with the captains orders, at Portsmouth Police court; however, the charges were dismissed, and they were not punished, as it was considered that they were unnerved by the Titanic disaster and would not normally have acted in such a way. While leaving New York, on 6th July 1912, Olympic lost control of her steering gear, resulting in an hour and a half delay. After signalling that she was not under control, repair work started, before Olympic went aground on a mud bank, although, fortunately she was was able to free herself. Olympic was then towed to deeper water, where the repairs were completed. Nearly 6 months after the Titanic disaster, and having been temporarily withdrawn from service, Olympic arrived back at Harland and Wolff, Belfast on 10th October 1912 to be modified following lessons learned from the Titanic disaster. Modifications included making her watertight bulkheads higher, having considerably more lifeboats fitted and a double skin added. As well as these modifications, the opportunity was also taken to add features present on Titanic that were missing from Olympic, such as the CafÃ© Parisian. Olympic returned to service on 2nd April 1913. On 7th February 1914, while passengers were having lunch in the dining room, a huge wave suddenly swamped the room causing some windows to break, and passengers to get drenched, twelve passengers also had to be treated by the ships surgeon as a result of flying glass. Following the outbreak of the First World War, Olympic initially continued to be used for passenger service, although it was planned that Olympic would be laid up. But instead of sailing to and from Southampton, Liverpool was used instead. On what was planned to be her last voyage before being laid up â€“ while returning from New York on 27th October 1914, Olympic come to the rescue of HMS Audacious, a British battleship that had struck a mine. Olympic rescued the crew and unsuccessfully attempted to tow the ship to safety, before HMS Audacious unfortunately sank. Upon her return Olympic was sent to Belfast where she was laid up. 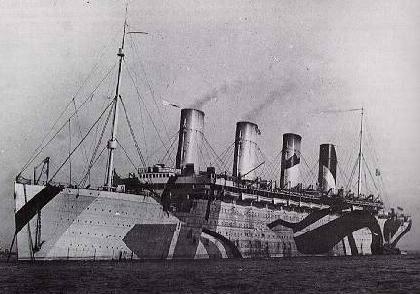 In September 1915, Olympic was requisitioned for use as a troopship; Olympic was quickly made ready war service and was painted in dazzle paint, to make it harder for the enemy to target her. Due to the fact that Olympicâ€™s Captain, Captain Haddock, was unable to be released from his war time duties, Captain Bertram Hayes was given command of the ship. On 24th September 1915, Olympic departed Liverpool for Mudros, on her first voyage as a troop transport, onboard were around 6,000 troops. During that voyage, on 1st October, Olympic rescued 34 survivors from Provincia, a French steamer that had been hit by an Austrian submarine. After the rescue, a submarine was spotted and evaded by Olympic. While in the eastern Mediterranean on 23rd February 1916, Olympic was attacked by a German U-boat, fortunately the torpedo fired from the submarine failed to hit the ship and Olympic escaped undamaged. On 28th February 1918 Olympic was again unsuccessfully attacked, this time from gunfire coming from a German submarine. On 12th May 1918, one of the most exciting parts of Olympicâ€™s career took place, when Olympic purposely rammed and sunk the German submarine U-103, which had been trying to torpedo Olympic. The survivors from the submarine were rescued by USS Davis. After a very successful career as a troopship, Olympic ended her war(/post war) duties on 21st July 1919, when she completed her last voyage as a troopship. Olympic then went to Belfast, where she was made ready to resume her passenger service, and at the same time the opportunity was taken to convert her from being a coal powered ship to being an oil powered ship. Olympic restarted her Southampton to New York service on 25th June 1920. Captain Bertram Hayes, who had commanded Olympic since 1915, started his last voyage as captain of Olympic, from Southampton, on 21st December 1921. Captain Hayes was transferred to White Starâ€™s new flag ship, Majestic (II). Captain Alexander Hambleton was given the role as Olympicâ€™s new commander. While departing New York on 22nd March 1924, Olympic collided with Fort St. George, of the Furness Bermuda Line, by accidentally backing into the smaller ship. Fort St George sustained considerable damage which meant her sailing had to be cancelled, Olympic was initially thought to only have minor damage and was able to continue, although, later it was discovered that Olympicâ€™s stern frame was so badly damaged that it had to be replaced. It was found that the collision was the fault of Fort St. George. At 3.30pm on 18 November 1929, Olympic was confronted with a violent tremor and continuously shaken for 2 minutes, despite this no damage was sustained, and it was later confirmed that the cause was the Grand Banks Earthquake. During various refits in the later part of her career, Olympic received modernisations such as extra private toilets and bath rooms, a dance floor in her dining room and a make shift cinema in her lounge; one refit in early 1933 saw Olympic have substantial improvements made to her engines. In heavy fog on 15th May 1934, Olympic was responsible for the worst incident in her career, when she smashed into the side of the Nantucket lightship, cutting the lightship in half. Of the lightships eleven crew members, only four survived. Following the merger of the Cunard Line and the White Star Line, Olympic become part of the Cunard White Star fleet, and flew both the Cunard and White Star flag, with the White Star flag on top of Cunardâ€™s. Although, by this time, despite Olympic being capable of continuing, her days were numbered, Olympic was now becoming an old ship in a fleet that was being greatly reduced, in difficult financial times. Olympic left Southampton for her last transatlantic voyage on 27th March 1935. This would be the last time that Olympic would make the journey that her and her sister ships, Titanic and Britannic, were intended for. Unlike the short careers of her two sisters, Olympic enjoyed a successful career and fulfilled her purpose. Olympic departed New York for the final time on 5th April 1935. Upon her return to Britain, Olympic was laid up in Southampton. On 10th September 1935, Olympic was sold to Sir John Jarvis, who then immediately resold her to Thomas W Ward ship breakers, to be broken up for scrap at Jarrow, UK. Sir John Jarvisâ€™s reason for buying Olympic was so that by her being broken up at Jarrow it would provide jobs to help reduce unemployment. Olympic left Southampton for the very last time on 11th October 1935, under the command of Captain Vaughn; as she was leaving, Olympic received salutes from other ships sounding their whistles. She arrived at Jarrow on 13th October. At Jarrow, Olympic was stripped and broken up as far as the waterline, before being towed to Inverkeithing, Scotland, UK, on 19th September 1937, for final demolition. Many of Olympicâ€™s fixtures and fittings were auctioned off, and some can be seen today in places such as the SeaCity Museum in Southampton, UK and the White Swan in Alnwick, UK. Copyright © 2007-2013 White Star History. All rights reserved.